Enlargement of the kidney is associated with acquired or congenital causes. The acquired causes of kidney enlargement are degenerative ( solitary cyst), obstructive causes such as pyonephrosis or hydronephrosis, neoplastic causes such as nephroblastoma or hypernephroma ( present as abdominal mass and painless frank hematuria.) and infection such as tuberculosis or perinephric abscess. The congenital causes of enlargement of kidney is due to polycystic kidney. Patient with enlargement of kidney may present with pyrexia, urinary tract infection and hematuria. In certain cases , it may be asymptomatic. Enlargement of the kidney not uncommon. Patient may complain of hypertension. Failure to thrive is associated with hydronephrosis, in patient with kidney enlargement. It is vital to evaluate any family history of polycystic kidney disease which typically occur during the third and fourth decades of life. Adult polycystic kidney disease sufferer may complain of hematuria, abdominal mass, loin pain ( due to bleeding or infection into a cyst) and chronic renal failure. Family history of death due to chronic renal failure ( as a complication of adult polycystic kidney disease) is worth mentioning. Infant with symptoms such as loss of weight for the first 3 years of life, pyrexia, hematuria, abdominal pain and masses may suffer from nephroblastoma. Diabetic patient may suffer from perinephric abscess . Hematuria, pyuria and dysuria are commonly associated with tuberculosis in an endemic area. On examination, the mass is palpable on either right or left sides of the loin. The mass is able to be palpate bimanually , moves with respiration and ballotable. On percussion, the large kidney is dull on percussion. However, strip of resonance is detected due to the gas which filled the overlying transverse colon across the swelling. A solitary cyst is smooth, tense and large. Polycystic kidney means the kidneys are embossed with cyst and smooth in surface. Polycystic kidney disease may extend down to the groin because of its large size. 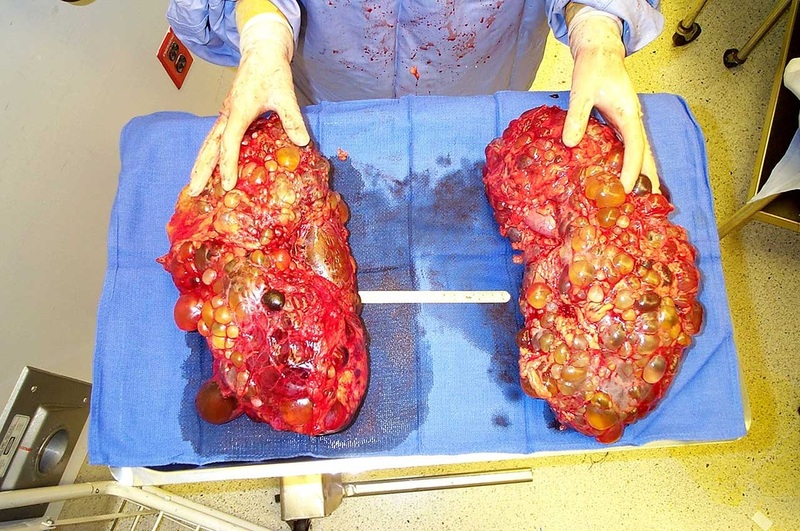 The polycystic kidney may be tender or tense following infection or bleeding. Swelling, redness and edema in the loin is associated with perinephric abscess. Large mass in the abdomen and loin is associated with nephroblastoma . Fixed, firm, irregular and nodular are the characteristic of hypernephromas. The laboratory investigations require are full blood count, urea and electrolytes, ESR, blood glucose, KUB, ultrasounds, chest x ray, urinalysis, cystoscopy, CT scan, IVU, antegrade pyelography, retrograde pyelography, MRI scan and angiography. Full blood count may reveal a rise in Hb level due to polycythemia from hypernephroma,. Low Hb may occur due to loss of blood from hematuria. In pyonephrosis or perinephric abscess, the white cell count will raise. In bilateral enlargement of the kidney the urea and electrolytes will rise. ESR level is elevated in infection, tuberculosis, nephroblastoma and hypernephroma. Blood glucose is useful to identify diabetes mellitus in patient with perinephric abscess. KUB ( kidney , urinary and bladder ) scan is useful to outline the renal tract to rule out hydronephrosis from ureteric or renal stones. Ultrasound will guide biopsy and useful to differentiate between solid and cystic lesions. Chest X ray may detect the present of metastases of hypernephroma in the form of cannonball metastases, Besides that, chest x ray may detect the present of tuberculosis or nephroblastoma. Urinalysis is useful for detection of any organism , pus cells and blood. Other investigation include cystoscopy to look for any bladder tumor, obstruction of the bladder outlet and obstruction of the ureter. CT scan is useful to differentiate between cystic and solid lesions as well as spreading of the tumor and biopsy. IVU /intravenous urography is useful for detection of the distortion of the calyces ( hypernephroma) , hydronephrosis and any absent of urinary tract function. Antegrade pyelography and retrograde pyelography are useful to detect the sites of obstruction. MRI scan is useful to detect any vascular lesion or renal parenchyma lesions. Angiography is also used for assessing the circulation.